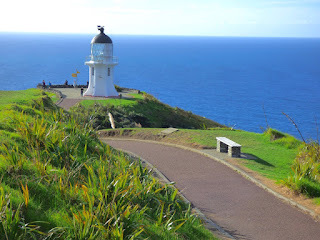 where the South Pacific and Tasman Sea meet. The boat work yards are nearly empty. 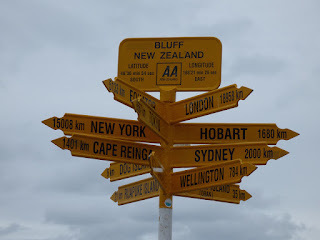 We've traveled from Cape Reinga, New Zealand's northernmost point to Bluff, its Southernmost and a whole lot of points in between, putting 10,000 km on our car in 3 1/2 months. We automatically drive on the left side of the road, don’t even cringe much on right hand turns anymore, Wayne's decided he loves roundabouts, but we don't want to find ourselves joining in seeing how many points we can get taking out a very pregnant woman crossing the street with another baby in her buggy. * Besides, we sold our car. *We found Kiwis to overall to be incredibly nice, though not so much when behind the wheel. We were appalled when no one in the small town of Paeroa would stop to let a very pregnant woman pushing her baby stroller complete her crossing of the road. Everyone at the naked BBQ is wearing jackets and our tan lines are gone because our tan’s gone. No see-ums (sand flies) and mosquitos are thick but finding few places warm enough to expose flesh to bite. It takes a supreme act of self discipline to not hurl my mobile phone into the ocean (I keep reminding myself it’s not the unlocked Android’s fault New Zealand has the clunkiest, most confusing, most expensive phone and wifi system of any 1st world country we’ve visited. We understand nearly everything said to us by Kiwis, that "beah" is "beer" (but we'll be drinking NZ dry cider instead), that we're messed up because we say "wadda" instead of wah-ter (for water), and how to pronounce Whangarei, politically correctly (Fa nga ay) or old school (Wang ah ay). We've spent two years of our cruising budget during our six month stay in New Zealand -- we're broke! 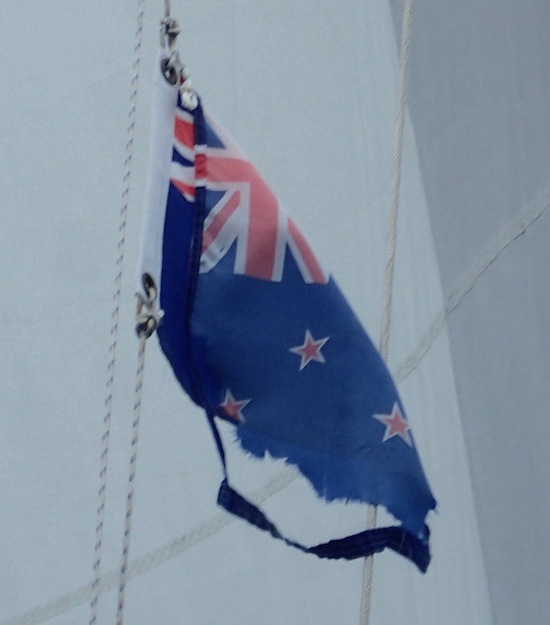 Our NZ courtesy flag is shredded. 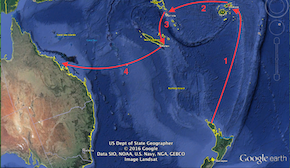 This Friday the 13th, we're not too superstitious to go when the weather window kicks off with Southerlies, without getting too much higher than 25 knots or lower than 8 knots between here and Fiji in a 12-day period. Bluff, New Zealand's Southernmost point, South Island. All ribbing aside, we loved our time in New Zealand, heartily recommend it, and hope to return someday. 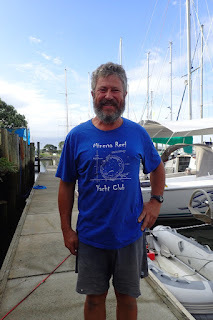 This was written and scheduled for posting while we were still in New Zealand anchored off Opua (S35.18.772 E174.07.485), waiting for a good weather window to our first major cruising stop this year, to Savusavu Fiji. By the time this posts, we expect to be about two thirds through the two weeks it will take to sail to Fiji, at 1170 nm, our 2nd longest ever passage. New Caledonia, Australia. ~4,500 nautical miles. Labels: cruiser humor, cruising new zealand by land and sea, South Pacific Cruising destinations.